Feeling stressed or overwhelmed with your workload? 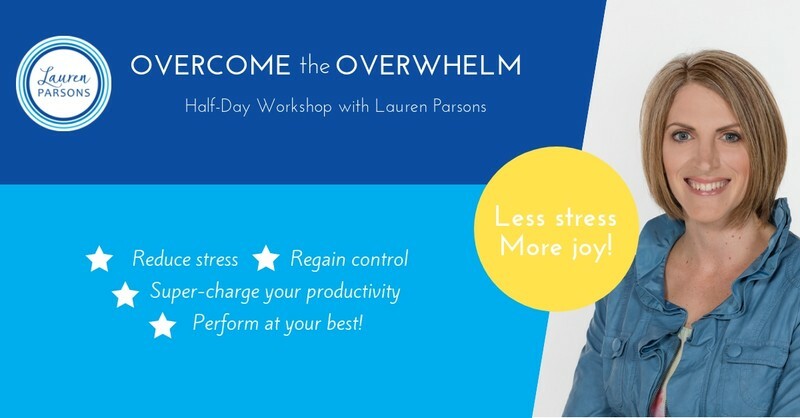 Whether you’re a business owner, leader or busy member of the team, this workshop will help you get out of the ‘overwhelm trap’, regain control and super-charge your productivity. It’s common, even for high-performing people to feel overwhelmed at times. With the current rate of change, impact of technology and level of connectivity we now experience in the modern world, it can be difficult to switch off or to prioritise so many competing demands. If you’ve ever wanted to know how to break out of that cycle and start to achieve more with less time, this session is for you. It will help you carve a pathway through the overwhelm, massively boost your efficiency and keep you cool calm and collected, even on the busiest of days. Tea, coffee and refreshments, workbook and follow up coaching all included to ensure your success. Learn exactly how to juggle the multiple demands of life, work and family, while staying in control. Transform the way you approach and structure your life and workflows so you achieve much more in less time, regain balance and experience more joy and satisfaction. Don't miss this powerful session which will help busy people regain balance and rediscover how it feels to thrive. Lauren Parsons is an award-winning Wellbeing Specialist who believes that everyone deserves to thrive. She is passionate about equipping and inspiring people to truly boost their health and happiness. With 18 years’ experience in the health and wellbeing profession in New Zealand she is a sought after speaker, coach and consultant. TEDx speaker, Author of real food less fuss, founder of the online programme Get Fit Feel Fabulous and the Snack on Exercise movement. Lauren helps busy people re-discover how to feel vibrant, confident and energised. Based in Palmerston North, New Zealand, she travels regularly and specialises in helping organisations create a high-energy, peak-performance team culture, which enables people to thrive.